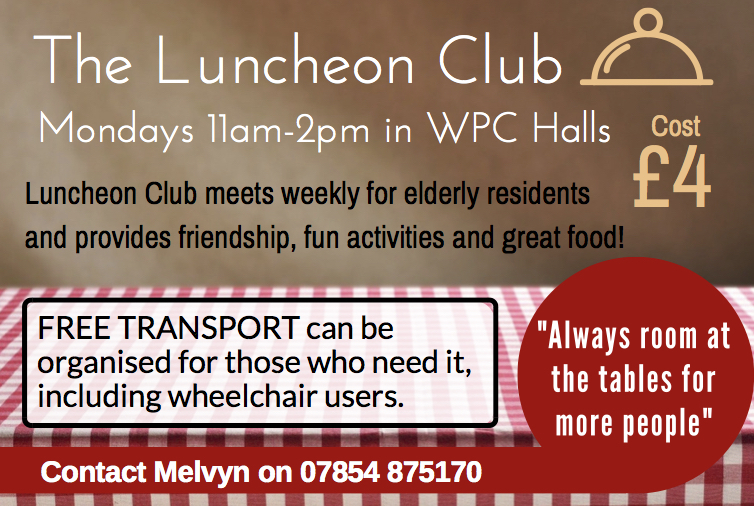 The Luncheon Club – for almost 30 years there has been a Luncheon Club held in the main hall for elderly residents. The group meets on Mondays from 11am to 2pm and is enthusiastically led my Melvyn and Pamela Hamilton. The club begins with tea/coffee and cake after which they engage in a range of activities including arm chair bowls, board games and more. The group also receives regular visits from both the Fire Service and Community Police Team for advice on home safety. This vital club provides friendship, the opportunity to connect with the world outside their home and some release for carers. In the heartfelt words of Melvyn and Pamela “We have room at the tables for more!”. If you are aware of anyone who could benefit from this existing community service, please get in touch with Melvyn on 07854 875170. The cost of each session is only £4 and transport is organised for those who need it, including wheelchair users, free of charge.